This new restaurant is a cause for true excitement. With its charming and welcoming decor it is perfectly located for lunch and after-work meetings. One can say it is a haven of good food, fine wine, and excellent service for everyone. The ambience is buzzy and informal making it the perfect spot to relax into easy conversation after a hard day work. Be prepared to dine with a hip crowd loving the cocktails and get ready for a tasty meal. Bastille Brasserie is a popular choice for birthday celebrations, get-togethers and parties. It is a firm favourite with discerning locals simply because with so much care put into looking after you, you won't want to eat anywhere else! The bar in the Bastille is separate from the main restaurant, which makes it an equally ideal place for those who only want to have a drink (or two). 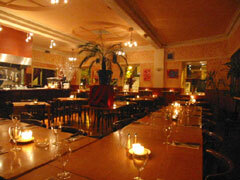 The menu is authentically French and offer's delicious brasserie style food. There is a very tempting range of mains including thin-based pizzas, bistro classics and house specials. What more can we say ...French food for a decent price with simple and efficient service.